Located 5.2 mi south junction Hwy 82 southbound interstate 90-94 Juneau cty WI Coordinates Lat N 43:45':417" Lon W 89:58'042"
From its source at Lac Vieux Desert to the Mississippi River at Prairie du Chien, the Wisconsin River descends 1,071 feet in 430 miles. Twenty-six power dams utilize 640 feet of the fall of the river to produce an annual average of one billion kilowatt hours of electrical energy. 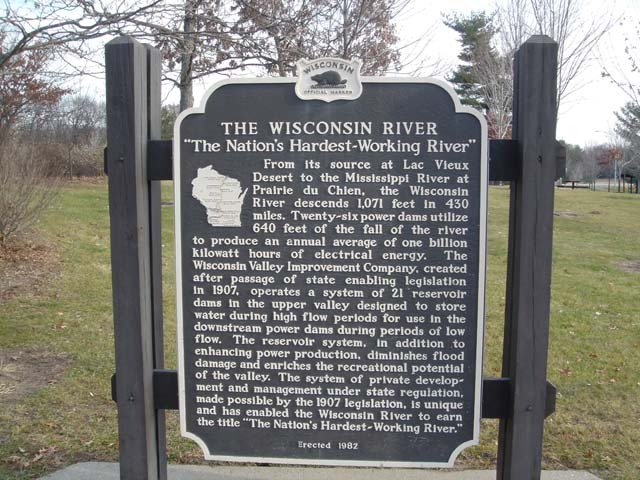 The Wisconsin Valley Improvement Company, created after passage of state enabling legislation in 1907, operates a system of 21 'reservoir dams in the upper valley designed to store water during high flow periods for use in the downstream power dams during periods of low flow. The reservoir system, in addition .to enhancing power production, diminishes flood damage and enriches the recreational potential of the valley. 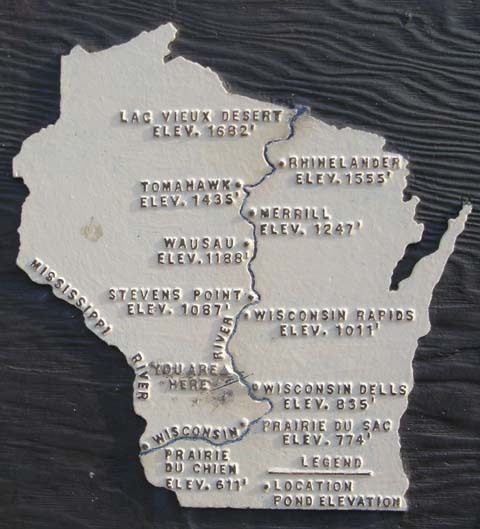 The system of private development and management under state regulation, made possible by the 1907 legislation, is unique and has enabled the Wisconsin River to earn the title "The Nation's Hardest-Working River."